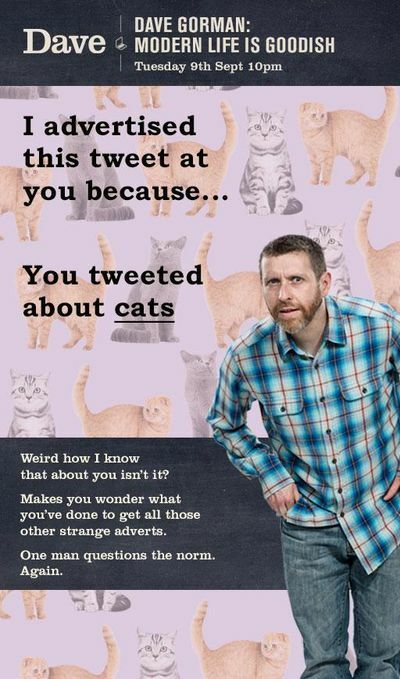 Over the past week, you may be forgiven for thinking Dave Gorman is stalking you. He’s been popping up outdoors, on screens and in the press, telling you in not-so-subtle ways to watch the second series of his new show, Modern Life is Goodish. And he’s rather spot-on in his targeting, isn’t he? 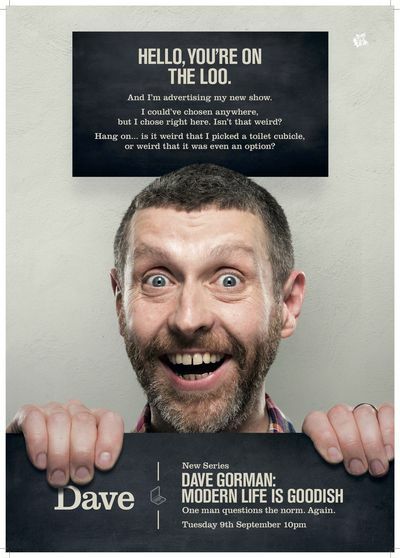 UKTV briefed us to create a campaign to promote his new TV series, starting on Dave at 10pm tonight. Together, we wanted to challenge the norm in marketing just like the witty comic challenges the norm in his critically acclaimed show. 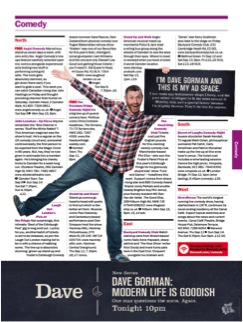 From popping up in your Facebook feeds and honing in on your Twitter chat, to disrupting the tried and true grid system of a magazine layout just because he can, the comedian is reaching new and existing fans by exposing the quirks of ad placement and social media targeting. Taking cues from the series, which points out life’s absurdities by making viewers think twice about the humour in everyday moments, the print, digital and OOH campaign pokes fun at the smoke and mirrors techniques used in advertising. 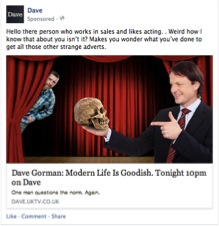 On Facebook, Dave highlights the eerily specific targeted ads that pop up on users’ newsfeeds. 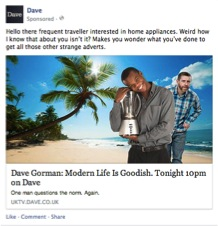 Promoted ads address users with playful graphics mirroring their own profiles, speaking directly to curiously specific groups including Scottish men interested in cooking and frequent travellers interested in home appliances. On Twitter, Dave is spooking twitter users by tweeting images directly at users based on the keywords they use. And online, he’s exposing the elaborate labels digital ad targeting applies to us. Energetic optimist? Sure. We'll take that one. 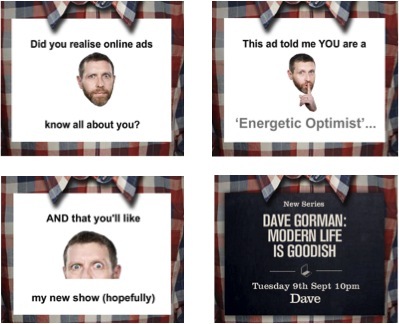 Keep an eye out for more of Dave Gorman interrupting your thoroughly modern life, and make sure to tune in for the first episode of Dave Gorman: Modern Life is Goodish tonight on Dave at 10pm. Next Next post: What happens to British brands if Scotland votes for independence?